Northeastern head coach Bill Coen was visibly pleased after the game. His squad entered Saturday’s contest against the UNCW Seahawks fresh off defeating Elon, William & Mary and the College of Charleston by a combined 40 points. On Saturday, his CAA Player of the Year runner-up, his CAA Defensive Player of the Year and his standout redshirt transfer combined for 58 points on 19-36 shooting. His team turned the ball over four times. Four. All game. His defense clicked. His offense revved. 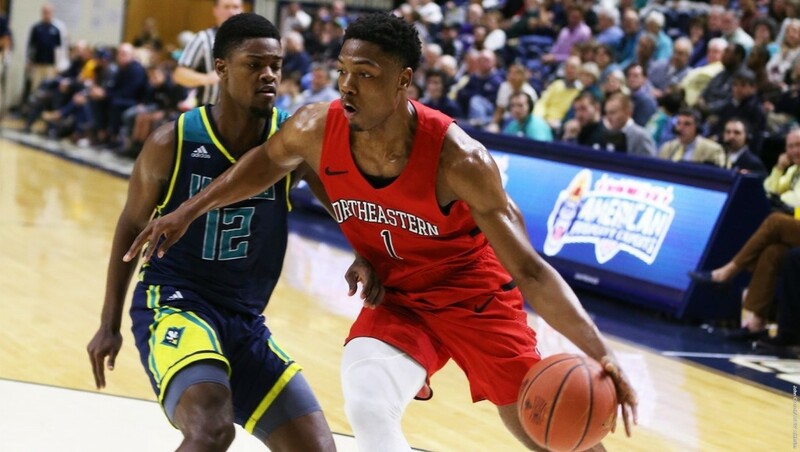 And his Northeastern Huskies squashed UNCW, 88-71, boosting their record to 11-8 (5-2 CAA) and showing that last season’s CAA Championship runner-up, after an injury-ridden start to the season, is rounding into form. The first half was close. The Huskies never led by more than eight and took a two-point margin into the break. Northeastern relied on three-point shooting from Pusica, Occeus and Roland, while UNCW (7-14, 3-4 CAA) battled inside with All-CAA First Teamer Devontae Cacok (23 points, 9-12 FG, 13 rebounds) and Jeantal Cylla (17 points, 7-12 FG). The second half was fun. And fast. And phenomenal. Northeastern outscored UNCW 48-33. They diversified their attack, balancing their perimeter shooting with fearless drives to the basket. And they slowed the Seahawk attack, something Coen credits particularly to Occeus. “He’s the guy that picks up in the backcourt, gets the ball under control, spearheads our defense,” Coen noted. “He’s gonna draw the toughest assignment. He does a great job with the scouting report…to know their pet moves and what they like to do. “He’s our first line of defense. Everyone talks about an offensive rhythm, but there’s a defensive rhythm too. The catalyst? Bolden Brace’s foul trouble. Northeastern faces Towson and James Madison this week before returning home to face the as-yet-undefeated Hofstra Pride and their CAA Player of the Year Justin Wright-Foreman. Given Towson (1-5) and James Madison’s (2-4) weak CAA records, the Huskies may have a six-game winning streak by then. But a few things are certain. After five consecutive double-digit scoring efforts and much stringent defense, Shawn Occeus looks healthy. Ditto Vasa Pusica, who’s logged 42 points on just 20 shots in the last two contests. Jordan Roland is finding his role with Occeus and Pusica in the lineup and is proving himself a reliable third (or even second) scoring option off the bench. And the Northeastern Huskies, who endured a hazardous non-conference schedule without their two best players, are finally flourishing.